Big boys and their toys. When you think of cooking Al Fresco you mainly think of barbecue food, but it doesn’t stop there. 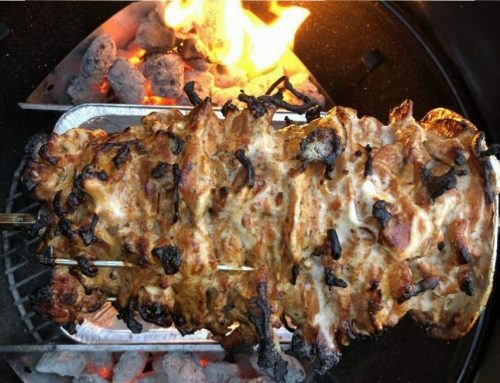 Smoking food is just another example of Al Fresco cooking which has always had its roots in the USA but is becoming ever popular in the UK too. Looking on the market there is plenty of new and exciting equipment to get your Al Fresco cook on! 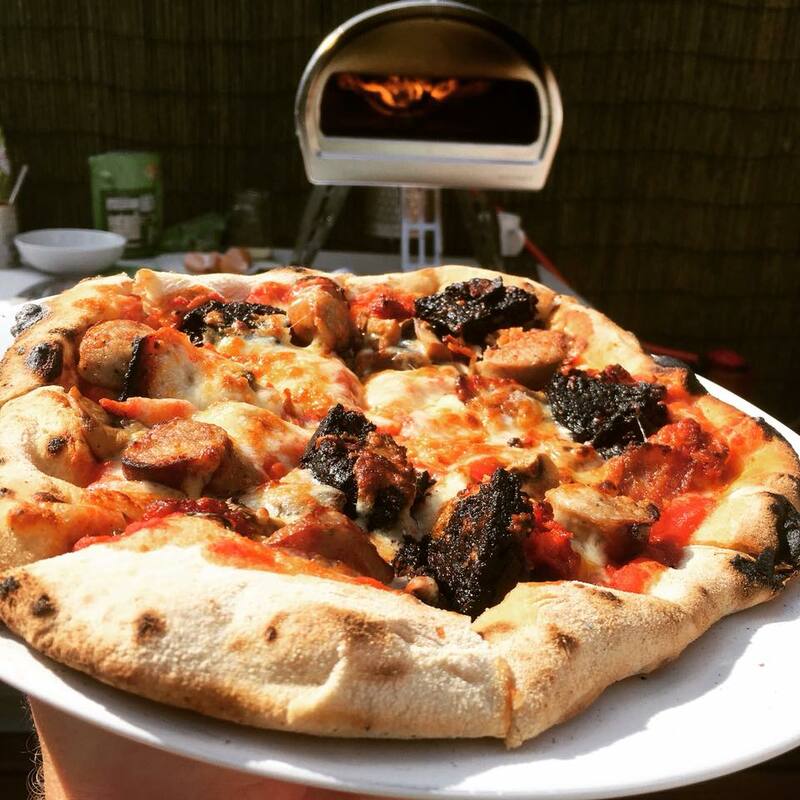 Here at Smokey HQ we have been eyeing up our options for cooking Al Fresco pizza. Who doesn’t love pizza, right? 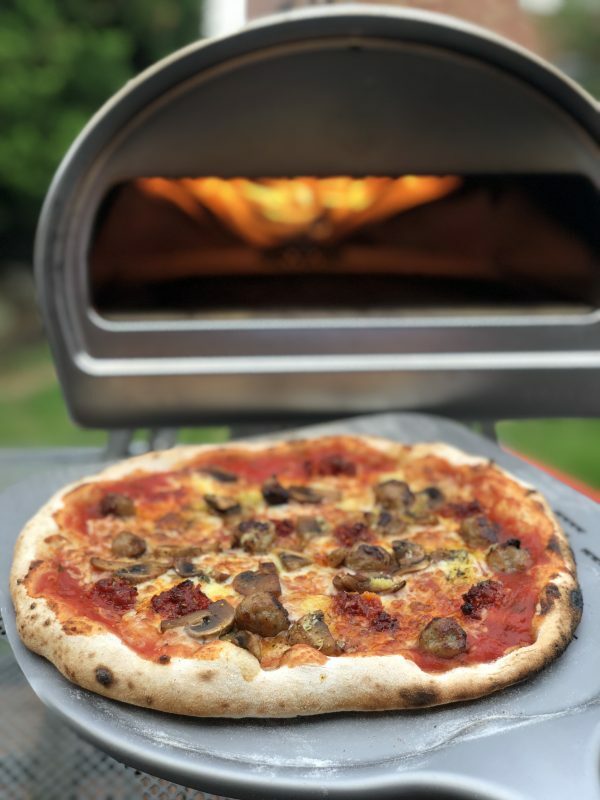 You could go all out and spend a few weeks building your own wood fired pizza oven in the garden but there are plenty of quick and easy options with an off the shelf pizza oven. Doing plenty of research I narrowed it down to the Uuni Pro and the Roccbox pizza oven. 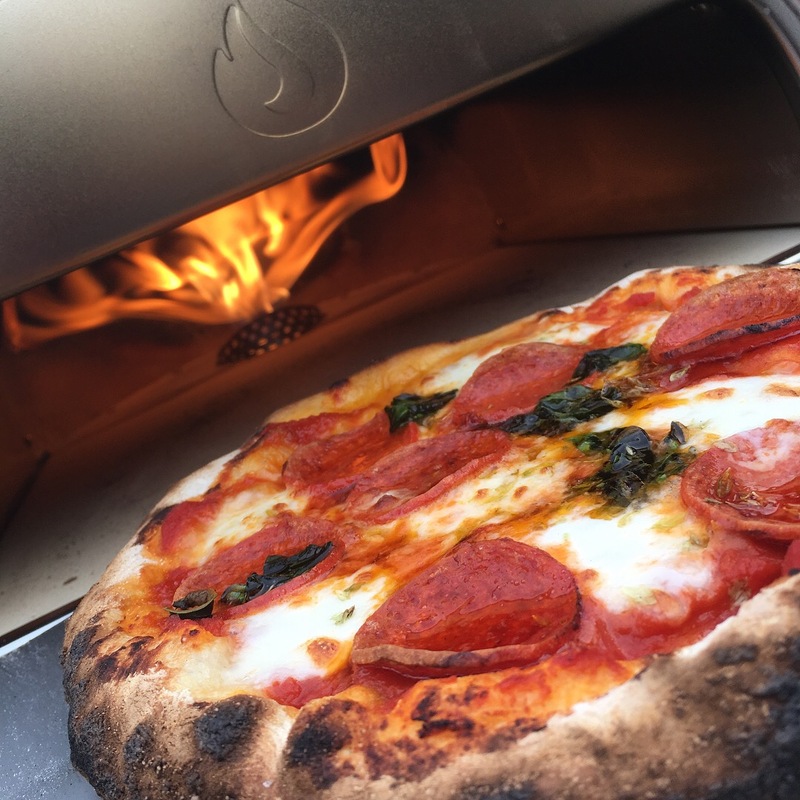 I had first seen Roccbox when they initially started and had considered backing their crowdfunding campaign to have their oven brought to market. So I decided the Roccbox was the one I wanted, but at £499 it was not a decision I took lightly. 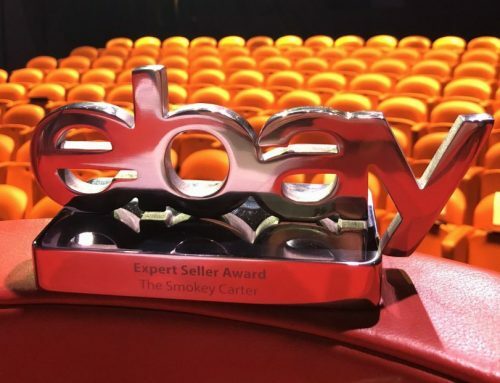 But hey, the only money I ever spend is on the business, so thought I deserved a new toy and there was a code for free delivery too (usually £19). 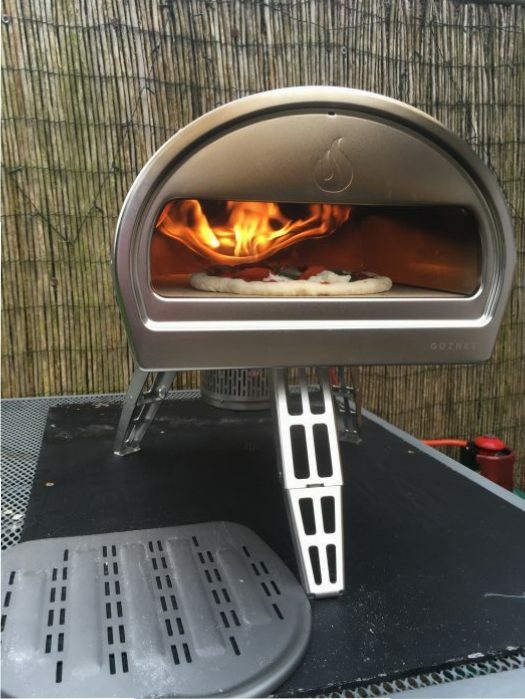 The Roccbox has the the option to both wood fire your pizzas or take the convenient route of gas. I ordered it on the Sunday, had the dispatch email on Monday. In preparation for Tuesdays arrival I headed out to get a few ingredients and made the dough. The usual suspects including a good tomato base sauce, mozzarella, prosciutto, pepperoni etc. I usually make my own tomato base sauce but just bought a good quality passata instead (we like to use the Pizza Express Pizza Sauce from Tesco). Eagerly opening up the box, scanning through instructions I got it set up which took no time at all. It’s design and build quality is stunning and it comes with a great pizza peel. It was also heavier than I thought. For ease of use, I connected the gas and as per the instructions fired the oven for half an hour on the lowest burn to season/cure the oven. Method – Combine the dried yeast with the warm water. Meanwhile add all the other ingredients into a bowl. Once the yeast has dissolved pour over the flour mixture. Combine well, until you are able to turn it out onto a lightly floured surface. Kneed the dough for at least 10 minutes. Place the dough ball back in the bowl and cover. We like to use a shower cap as it fits nicely over most bowls. Whenever we stay in hotels I always make sure I come away with a supply of shower caps for proving my dough. Leave the dough to prove overnight or for around 24 hours. I find this intensifies the flavour. Place a piece of cling film over your scales and weigh out the dough balls into 200g each, place them on a floured tray (we like to add a little cornmeal too, for extra crunch) and cover with cling film until you are ready. 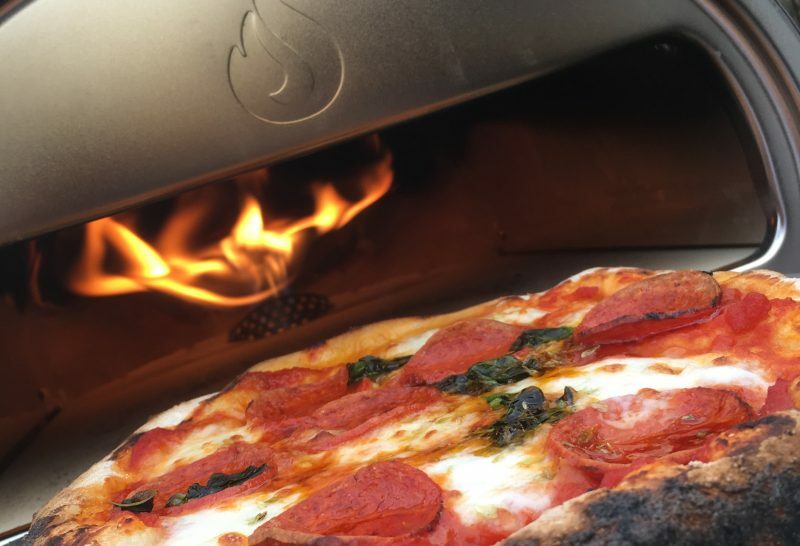 Remember the Roccbox pizza oven takes approx 15-25 minutes to heat up to temperature. Start by using your fingers in the centre of the dough ball to flatten out the dough and stretch to around 10 inches. Leave a centimeter or two at the edges untouched as this will puff up in the over. Add your toppings and away you go. After cranking the Roccbox up to full blast and leaving for 15 minutes the temperatures were reaching 400 degrees so I decided it was time. The first pizza had to be a classic Margherita, with buffalo mozerella, tomato sauce, oregano, fresh basil and a drizzle of extra-virgin olive oil. Ok so I didn’t get a picture because I was too excited. The second was the same but with pepperoni. I thought it might take a little time to get the knack and expected some disasters but everything was perfect. 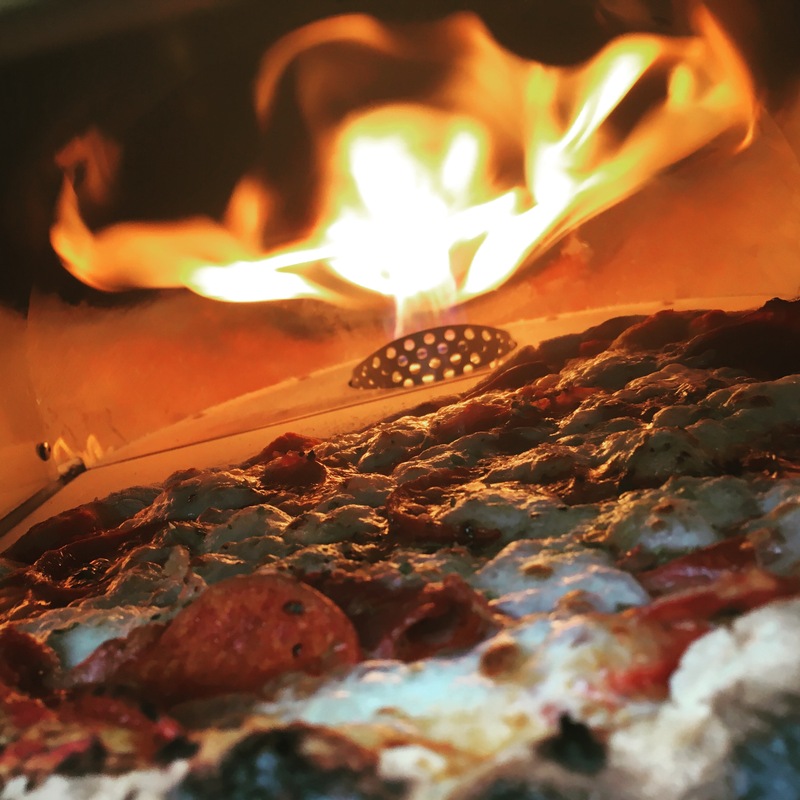 The pizza edges start to puff up almost instantly and you can watch the pizza cook in around 90 seconds turning every 20 seconds to make sure it cooks evenly. The searing heat ensures a crisp and what I would describe as one of the best pizzas I have had. After 4 pizzas with various toppings (Not all to myself, honest!) I turned off the Roccbox. 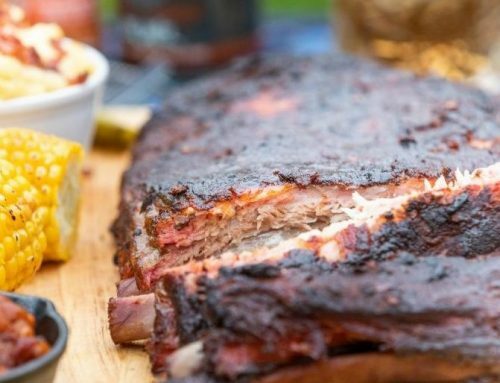 We hope to bring you a whole series of recipes using the Roccbox, incorporating our range of World inspired BBQ rubs and sauces. It’s not just for pizza either as you can easily cook a steak, veggies or burgers in a cast iron skillet pan. Watch this space for recipes. You can check out the Roccbox on their website www.roccbox.com. They’re not paying me to say this but all I can say is that it’s an awesome bit of kit and it won’t be long before it’s out again. 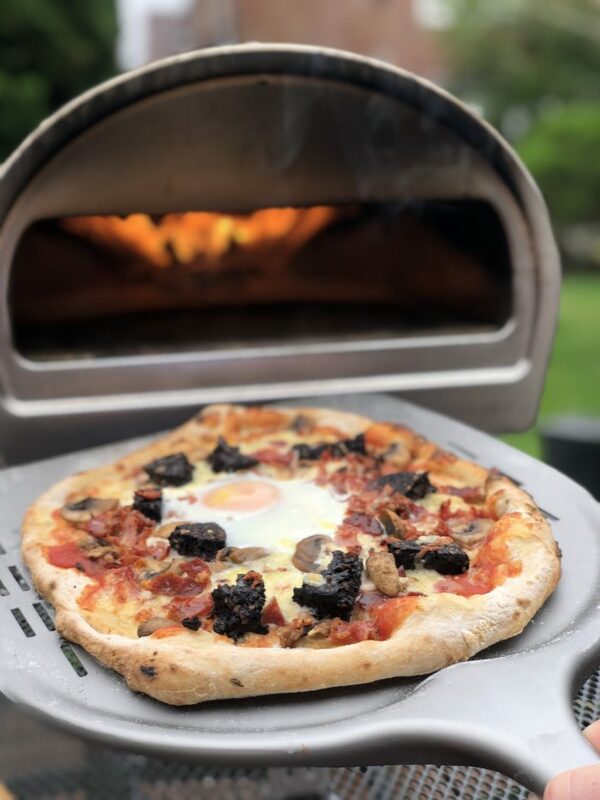 Combine the Roccbox pizza oven with The Smokey Carter range of World inspired BBQ Rubs & Sauces for the ultimate pizza combinations! 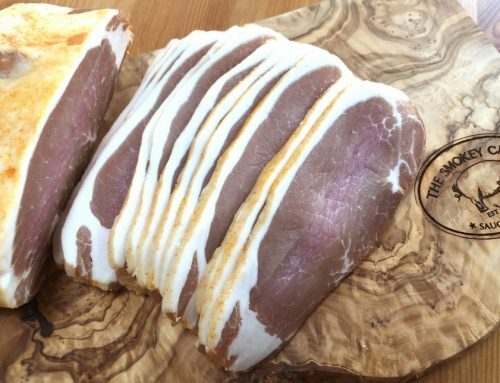 New Age Hawaiian Smoked ham with our Pineapple Express Hot Sauce drizzled over (A tasty modern take on the Hawaiian). Why not try our Spiced Pineapple and Nigella Chutney too. BBQ Base Pizza – Who doesn’t love a BBQ sauce base pizza? Mix our Chipotle & Bourbon BBQ Sauce 50/50 with your usual passata tomato base for a spicy barbecue base. Top with your favourite toppings. Mini meatballs work a treat. Jerk Chicken Pizza – dust some of our Jamaican Jerk BBQ Rub over some chicken breast strips and fry in a pan until cooked through. Add on top of your standard Margarita pizza and add a drizzle of our Jerk Ketchup just before serving. Dip It – We love dipping those chewy Neapolitan style pizza crusts into some of our Smokey Chipotle Mayo. Get dippin and enjoy! Drizzle It – Drizzle our Carolina BBQ Sauce over your favourite pizza. 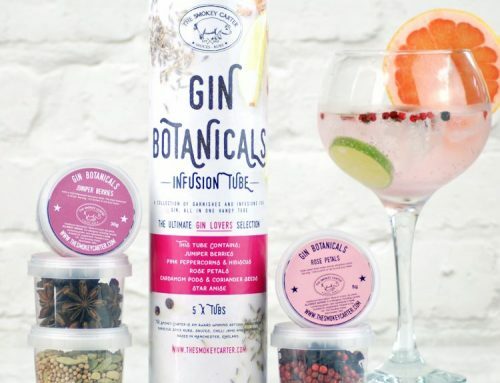 It just about goes with anything and gives a lovely sweet tangy kick to your pizza. 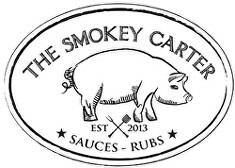 Take a look at our full range of World BBQ rubs and Sauces Here! Nduja – This spicy spreadable salami from Calabria in Italy is amazing on pizza. Sometimes simple is best. Make your basic margherita and add on small lumps of the Nduja. It will melt over your pizza and form little crispy lumps of spicy tastiness. Yum! Fennel Sausage Meatballs – Meatballs are awesome on pizza but when you combine with fennel they are on another level. Buy sausage meat or squeeze out the meat from the casing of a sausage. Mix with fennel powder and some ground fennel. Make into tiny meatballs (about 1.5cm in diameter) and fry in a pan until golden. Leave to cool and set aside in the fridge until you are ready to get cooking up some pizzas. 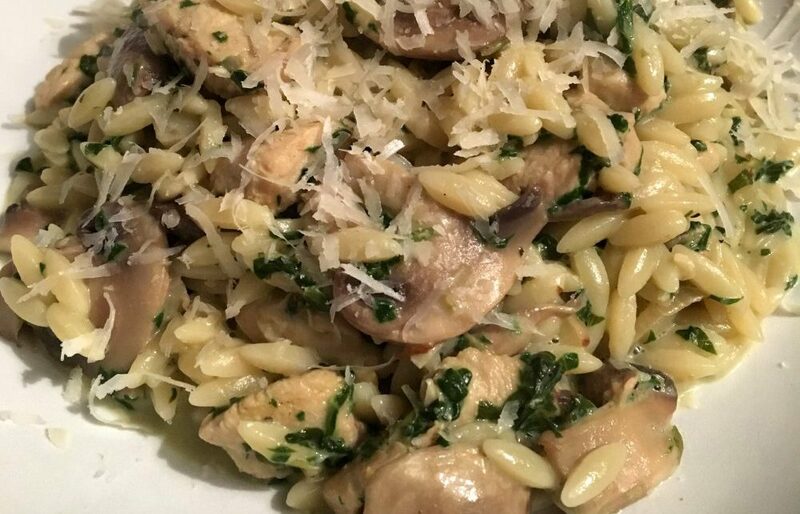 Garlic Oil – I always crush a load of garlic and cover with olive oil. This is great for just drizzling over the pizza before they go in the oven. Oregano – I love oregano on pizza and have a few different varieties of dried oregano from Portugal, Greece and Mexico. I find the Portuguese mixed with some of the Greek works best. The Mexican is a little too earthy for pizza. I usually have a small ramekin with oregano, flaked sea salt and ground black pepper in. It’s great for just grabbing a pinch and seasoning the pizza before going in the oven. Remember cooking on the Roccbox is all in the prep as when you actually get down to cooking, it’s done in a flash. This can be done well in advance or even the night before. Pre cook any ingredients such as mushrooms, meatballs, bacon and peppers. Have all your ingredients set out. 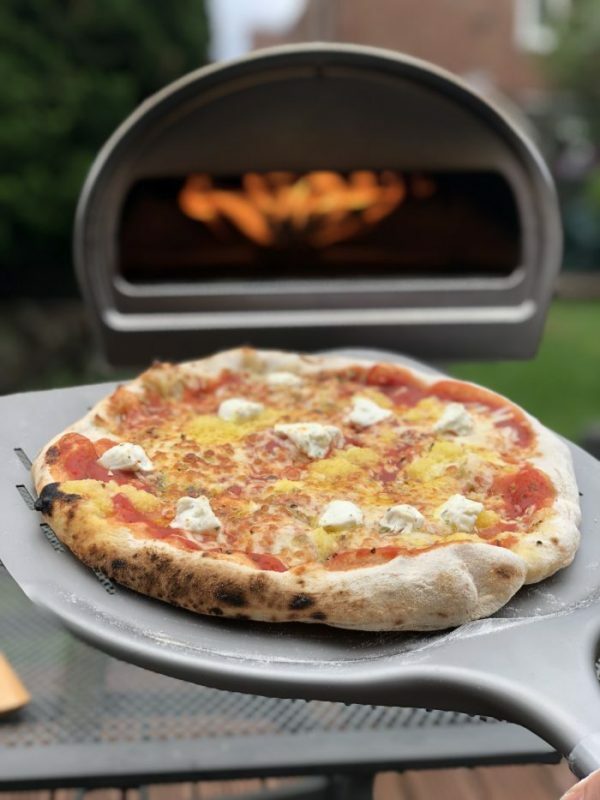 The Roccbox is great for a pizza party, and we have done a few. I’v spent many an evening churning out pizza until everyone is full. Start simple with maybe a tomato based garlic bread using passata and the garlic oil, maybe throw some mozzarella on there too. Everyone loves a garlic margherita. Get people to choose their own toppings and wheel up the pizza for everyone to dig in. When you have a few people, it’s easier to just do buffet style where you just keep making pizzas and everyone has a slice of this and a slice of that. I’v done individual pizzas for 4 people and by the time the first person is finishing their pizza the last person is just getting theirs, so it’s good to just graze your way through. Afterall you can’t make the last person wait…this is Roccbox Pizza! After a night our with a few mates, I thought breakfast pizza could be a great idea. Apart from the dough preparation, it was just as quick as cooking a fry up. 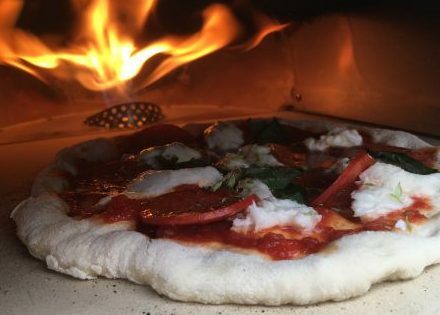 As the Roccbox cooks pizzas so quickly, you need to pre cook some of your ingredients. We pre cooked black pudding, streaky bacon and sausages. We also like to pre cook the mushrooms too. Spread on all the toppings over a tomato base leaving a little space in the middle for your egg, and cover to your liking with grated mozzarella. Crack the egg into the centre and slide into the oven. As it was fairly loaded with toppings it took a little longer. Just make sure you turn regularly for a nice even cook.